Congress communications in-charge Randeep Surjewala said defence preparedness cannot be a subject for politicising. Congress accused Nirmala Sitharaman of using the defence ministry premises for "political mudslinging". 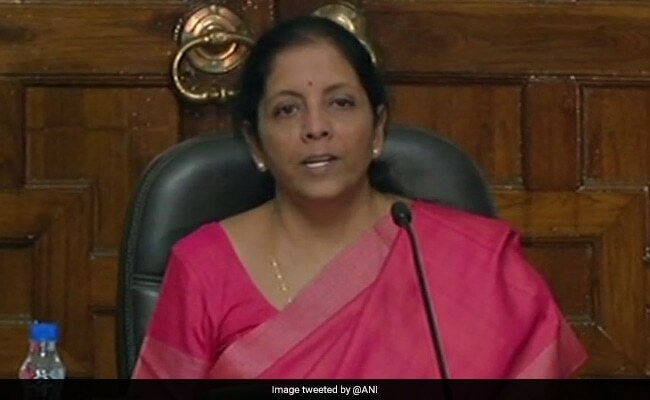 New Delhi: The Congress today accused Defence Minister Nirmala Sitharaman of "misleading" the nation on the Rafale fighter aircraft deal by not making public the price of the aircraft, and alleged a "cover-up". Congress communications in-charge Randeep Surjewala said defence preparedness cannot be a subject for politicising, and accused Ms Sitharaman of using the defence ministry premises for "political mudslinging". "Repeated attempts at shoddy cover-up and complete non- transparency in purchase of Rafale aircraft have raised serious questions on national interests and national security by the Modi government. "You hold political press conferences in BJP offices where you indulge in political mudslinging but you can't violate the sanctity, the integrity of the defence ministry by making its premises an occasion or a platform for political mudslinging and I think that is most unfortunate," he said. Asking why the defence minister or the Modi government are hiding from disclosing the aircraft price, Mr Surjewala said, "The question is rather simple. What is the price per aircraft of the 36 Rafale aircraft being purchased by the Modi government?" He asked whether it is correct that per aircraft price of Rafale as per the UPA government's negotiations was USD 80.95 million or Rs 526 crore as against the purchase price by Modi government of Rs 1,570.80 crore per aircraft. "Why has the price gone up then? From Rs 570 crore to Rs 1,570.80 crore? And does it mean that there is clear cut loss to the exchequer? And who is responsible for the same?" he asked. The defence minister said that Anil Ambani did not go to France, but his company itself has issued a statement saying he was there in France, Mr Surjewala claimed. "So, who is lying? And who is misleading the country? The day when Modiji announced purchase of Rafale aircraft on April 10, 2015, in France, Anil Ambaniji was present there. "Why is the minister misleading the country? The country is seeking answers for the questions and she will have to answer it," he said. It is surprising that Sitharaman said India does not require transfer of technology and that the "transfer of technology of manufacturing aircraft does not make any sense", according to the Congress leader. "Whether she will tell the country why 'Make in India' does not make sense? Why the defence minister and Modi government find 'Make in India' as non-sensical? "What objection does Modi government have if technology is transferred to a public undertaking so that it can manufacture the aircraft with licence? Whether the minister wants to say that the Modi government will not purchase aircraft from Rafale (in future) after the buying these 36 aircraft?" he asked. Mr Surjewala asked how the prime minister took a "unilateral decision" on buying 36 aircraft of Dassault, bypassing the mandatory defence procurement procedure and in the absence of an inter-governmental agreement with France at that time. He also questioned why public sector undertaking HAL was bypassed for getting the offset contract of Rs 30,000 crore despite the work share agreement of March 13, 2014, between HAL and Dassault Aviation. "Why did the prime minister promote the interests of a private corporate entity over a public sector undertaking? "Is it not correct that HAL is the only Indian entity which has decades of experience of building aircrafts? How was HAL by-passed in favour of Reliance, when Reliance had zero experience of building fighter aircraft?" he questioned. On the defence minister's remark that emergency purchase was made as the UPA did not buy it for 10 years, Mr Surjewala said, "Truth is they are not going to purchase even a single aircraft during five-year rule of Modiji. So what is the consequence of the emergent purchase? Hence, instead of misleading the country, they should give direct answers to the questions asked." He also said that it was the Congress that initiated internal bidding process and if there was delay in it, the BJP should tell how many aircraft they bought in last 41 months. "When she is not telling purchase price of the aircraft, how would you know the aircraft price has gone up? At least, she should tell what is the price of the aircraft?" he said.